I was searching for a replacement lightbulb for the G650GS. Now that I’ve been spoilt by the superb LED headlamps of my R1200GS, the stock bulb that came with the bike was a little too dim for my liking. And so I went on to do some research for some replacement lightbulb. 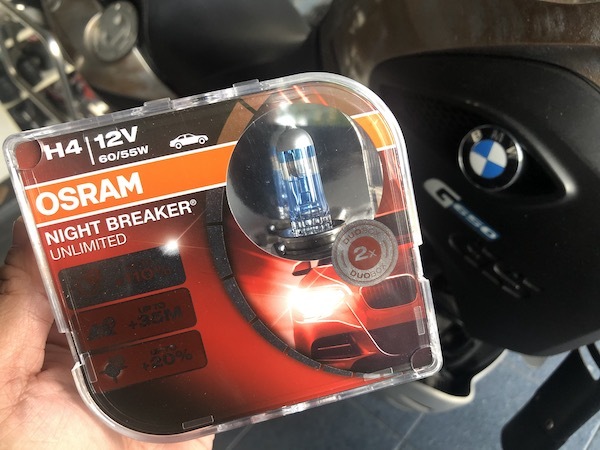 Unboxing the Osram Night Breaker Unlimited. The G650GS use a single H4 55/60W bulb for both dipped and high beams. I wanted something brighter, and I wanted something street legal. And so I immediately dismissed all the high-powered “off-road only” bulbs. And since the road regulations in Singapore are pretty strict with headlamp modifications, I dismissed the HID and LED conversion units too. I have previously used a set of Ring Automotive’s Xenon Ultima in one of my car which I have since sold. Ring Automotive promises a whopping 120% more light. I recalled that while it was appreciably brighter than the stock headlamp bulb, the longevity of the bulb wasn’t great. It blew way faster than I expected it to.